While there are dozens of things you can clean with a Magic Eraser, you should also know about these 5 things you should NEVER clean with one! Of all the cleaning tools that I’ve used over the years, the Magic Eraser is definitely one of the most useful. When used properly, a Magic Eraser can make cleaning faster and easier than almost any other cleaning tool could! But while I am a huge fan of them and use them frequently while cleaning at home, a Magic Eraser is NOT the best tool for every cleaning job. Magic Erasers are made from melamine foam, which acts like a very fine sandpaper. It’s great for cleaning stubborns marks and messes, but it can also scratch certain surfaces and remove protective finishes. And that’s what I’ll be helping you avoid in today’s post! Today I’m sharing a list of five things you should avoid cleaning with a Magic Eraser. I’ve also included some general tips that will help you use Magic Erasers safely and minimize potential damage. With the help of the tips in today’s post, you’ll never have to wonder when you should or shouldn’t use this amazing cleaning sponge! Abrasive materials like a Magic Eraser can remove the protective seal on your stone countertops. Without that protective seal, your stone could be vulnerable to scratches, stains, and other forms of permanent damage. What To Use Instead: Use my easy-to-make homemade granite cleaner and a microfiber cloth to wipe down stone countertops. This combo will keep your stone countertops clean, shiny, and protected! Nonstick cookware can be really convenient to cook in, but it requires special care. The nonstick coating can scratch easily, especially if you clean it with abrasive materials like a Magic Eraser. Once a nonstick pan is scratched, the chemicals from the nonstick coating can get absorbed into your food—and no one wants that! What To Use Instead: Hand wash your nonstick pans with a soft sponge and a bit of dish soap. If you have a really stubborn mess on your hands, use a bit of baking soda to help loosen it up. Even with as durable as stainless steel can be, using a Magic Eraser to clean it will likely end up leaving small scratches on the surface. While some people are fine with scratches and scuffs on their stainless steel, other people may want to protect that super shiny finish for as long as possible. The screens of your electronics (including your phone, tablet, TV, or computer) need to be cleaned super gently to avoid scratching them. That means that Magic Erasers are a big no-no for cleaning screens! 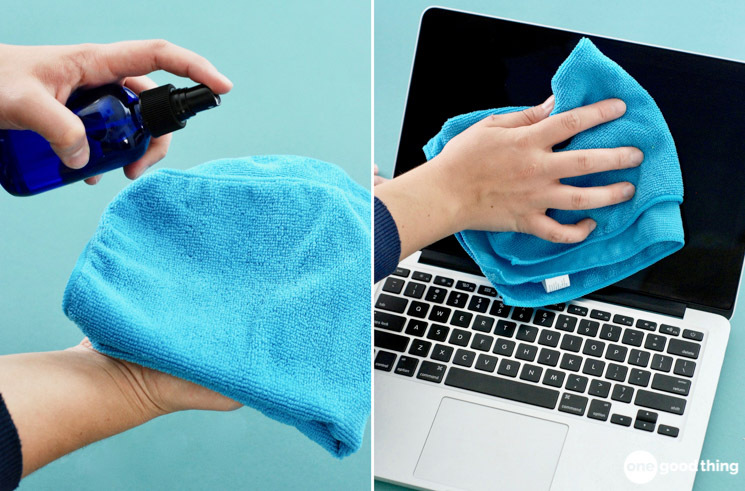 What To Use Instead: Clean the screens of your electronics with my homemade screen cleaner solution and a clean microfiber cloth. Your car’s paint job is covered in a protective coating or wax, which helps protect the paint and make your car easier to clean. But a Magic Eraser can rub right through that protective coating down to the paint easily! You can use a Magic Eraser to remove particularly stubborn bugs from the front end of your car, but just make sure to be conscious of how much force you are using. What To Use Instead: Washing your car by hand is usually the safest way to clean it. especially if you do it using microfiber cloths. But if that’s not your thing, you can always take it through a touchless or soft-touch car wash! Don’t use them dry. Wetting down a Magic Eraser softens the sponge and makes them less likely to scratch the surface you’re cleaning. Do a spot test. When in doubt about whether you should use your Magic Eraser, do a spot test in an inconspicuous spot to see how it fares. Wear gloves. The superfine abrasive material can aggravate your skin, especially if you already have sensitive skin to begin with. Wearing a pair of rubber gloves will keep your hands safe! Be gentle. Always rub as gently as you can while still removing dirt and grime. Using too much pressure can not only scratch surfaces, but it can also take paint right off your walls. What Should I Clean With A Magic Eraser? Just because a Magic Eraser isn’t the best tool for the cleaning jobs above, that doesn’t mean you can’t ever use it! 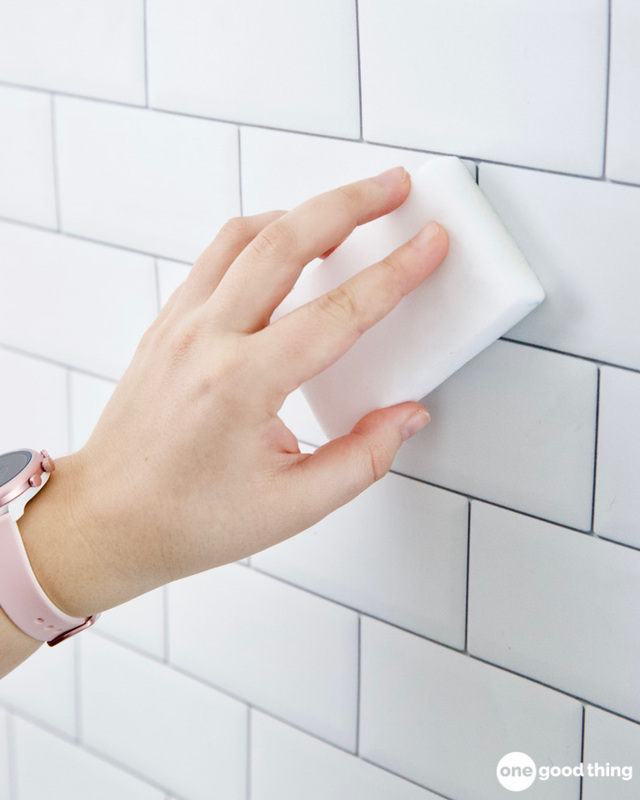 Magic Erasers are one of my go-to cleaning tools, and they make so many cleaning tasks so much faster and easier for me. What’s your favorite way to use Magic Erasers? You can use this on clear coated surfaces, you just have to be careful not to push hard. I would say, push down as hard as you would on a the soft spot of a baby’s head. This “cleaner” requires very little effort. As the article reads, this is much like a fine grade sandpaper. Fine grade sandpaper is used in the restoration process of automotive finishes, however it is always used with a compounding/buffing process to return the finish to pre damage condition. I used one with Kaboom to take the soap scum off of fiberglass tub surround. It took the shiny finish right off. Sadly, I used one to take scuff marks off my laminate floor. It took off the finish, so add laminate floors to things you should never clean with magic markers! Used to remove black scratches on wood floor. Bad idea! Took the finish off. Now have bigger mess! Our cleaners used ME on our wood floors to remove scuffs made on the floor. Now the finish is gone, all we see are scrubbed marks on our floors. My question is, what did you do to fix the problem? Before you use these you MUST ask: Would I scrub this with sandpaper? ! I once got permanent marker on my legs and thought I should use a magic eraser to get it off because it had removed it from other hard surfaces. I learned a good lesson, it got the marker off, but it also took the first layer of skin! Ouch! I used a Magic Eraser on an old Hammercraft aluminum pot. Unfortunately, now everything sticks. Obviously it was a mistake to use. Is there any way to fix the pan or have I ruined it forever? Is it still safe to use the pan if I add oil to keep from sticking? Don’t use them on a whiteboard either! After being told by an art instructor that Magic eraser worked well to remove watercolor paint, I researched the contents of the Eraser. As mentioned above, it is melamine, which is toxic to the environment. Little particles are flushed down the drain and into our water supply and, eventually, the ocean. Google melamine and be informed before using the Eraser. Not all Magic is what we think it is.